Presidency Accuses OBJ Of Plotting A Political Self-serving'' Crisis In Order To Head An Interim Government! Presidential media aide, Dr. Reuben Abati issued a statement yesterday in which the presidency accused the former president Olusegun Obasanjo of sowing seeds of discords among Nigerians so that he could come back into power through the back door. Dr. Jonathan’s remarks followed comments by the former president on Saturday that President Jonathan was plotting to destabilise Nigeria as it becomes apparent he will lose upcoming elections. We find the false claims and allegations reportedly made against President Goodluck Jonathan by Chief Olusegun Obasanjo on Saturday in Abeokuta very odious and repugnant. As we have had cause to say before, it is most regrettable indeed that a man like Chief Obasanjo, who should know better, chooses to repeatedly, wantonly, and maliciously impugn the integrity of a sitting President of his country for the primary purpose of self-promotion. It is obvious from Chief Obasanjo’s serial vituperations against President Jonathan who is doing his best to positively transform Nigeria for the benefit of all of its people that he has willfully chosen to close his eyes to the present administration’s good works and intentions. For reasons best known to him, Chief Obasanjo has set his mind on regime change by fair or foul means. Otherwise, it would be completely senseless, irrational and out of place for Chief Obasanjo, who still claims to belong to the same party as the President, to accuse President Jonathan of plotting to win the rescheduled presidential elections by “hook or crook” and planning to plunge the nation into crisis if he loses the election. For the record, President Jonathan has no such intention and will continue to give the greatest possible support to the Independent National Electoral Commission (INEC) and other relevant federal agencies to ensure that the rescheduled elections are successfully conducted. 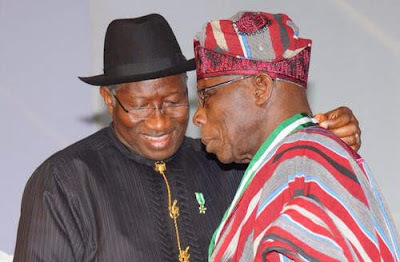 Indeed, it is not President Jonathan who remains faithful to his oath of office who is trying to plunge Nigeria into crisis, but Chief Obasanjo who is scheming to plunge the country into chaos in pursuit of a selfish and highly egocentric agenda. Chief Obasanjo’s plot with others within and outside the country to thwart the general elections and foist an unconstitutional Interim National Government, which he hopes to head on the nation is well known to us, but by the Grace of God Almighty, his odious plan to return to power through the back door will fail woefully. We know very well that it is in pursuit of this nefarious plot that the former President continues to sow the seeds of discord and crises in the polity by purporting to remain in the ruling party while openly consorting with the opposition, endorsing its candidates and predicting victory for opposition candidates in a manner most unbecoming of a supposed elder statesman. Thankfully, the vast majority of Nigerians who are patriotic and right-thinking cannot be fooled by Chief Obasanjo’s antics. We urge them to be assured that President Jonathan's commitment to democracy in all its ramifications remains constant and that he will never be party to the use of any unlawful means to remain in office or gain political advantage over his opponents. The President stands by his commitment, which he reaffirmed on national television last Wednesday that on his watch, all elections in Nigeria, will be free, fair and credible, and that all certified election results will be respected. As President Jonathan has also assured the nation, the rescheduling of the general elections was in the best interest of the nation and was never driven by any ulterior motive on the part of government as Chief Obasanjo and others have alleged. President Jonathan will continue to put his best efforts into giving Nigeria quality leadership and will not be distracted from his purpose by unwarranted and needless criticism by persons who ought to know better. The President also continues to trust in the good judgment of Nigerians and to believe that in appreciation of his sincere efforts to move the country forward over the past four years, they will re-elect him for a second term on March 28, 2015 with a mandate to pursue his agenda for national transformation to a successful conclusion.